Even the best of us take for granted the simple things you need to include in your email marketing campaigns we send out on a regular basis. So here is a list of things you must have that will help you grow your list, get more opens and clicks for your emails, and have a super successful campaign. Make sure you take the time to think about what’s going to get your email opened. Look at your past campaigns, see which ones got the highest open rates and try to emulate the type of subject line you used. 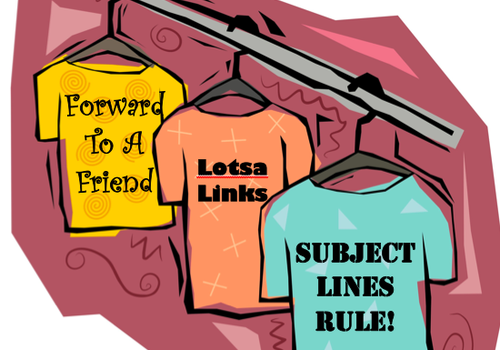 Try one of our 50 All Time Great Subject Lines and see if one works for your business. If you can’t see images add “YourVRFromLabel@mail.vresp.com” to your address book. You don’t know what it’s going to take to entice your recipient to forward the email to a friend of theirs so your message gets out to a wider audience. So even if they don’t click on a “forward to a friend” link you include, it may make them remember to simply forward it using their email client. If you’ve got images of your product, go ahead and include them. Like they say, an image is worth a thousand words. Just remember, some email readers strip out images so make sure your copy that you write also tells the story. Nothing works on your recipients like a familiar logo of a company they do business with. Remember to include image “alt tags” that will show the name of your company or product in the event your images don’t display properly. This is simply the U.S. Federal Law, so be sure to include your postal address in each of your email campaigns. Even if you’re emailing from outside the U.S. many times you don’t know where your recipients are. Even the best email marketing campaigns get unsubscribes, but bottom line is you don’t want to continue to send emails to recipients that don’t want them. Not only is this included in the federal CAN-SPAM legislation, but it will end up tarnishing your company reputation with negative word-of-mouth. Make sure you constantly solicit testimonials from your customers and recipients. Then feature them in your email campaigns. You’ll get two things from them; 1) They’ll likely forward it to all of their friends and 2) Nothing sells better than a customer selling your products or services for you. If you think you’ve got too many links…add more! You never know what link your readers will be compelled to click, so make sure you’re linking words and images and you’re linking often. If you’ve got people following you on Twitter, or people who are Facebook fans, make sure you include these links in your email marketing campaigns. You’ll spread the word to a wider audience from within these campaigns. Check out our free download: Social Media Checklist. Above and beyond these ten “must-haves” you’ll obviously want the articles in your newsletter or your sales copy to be compelling as well. Use this as a checklist for your next email marketing campaigns!